7.3 × 7.3 × 3.3‑inch omnidirectional building antenna. Mounts to drywall ceiling or other drillable, horizonal surface no thicker than 1.5 inches (mounting nut included; ceiling access required for installation). N‑female connector with “pigtail” cable attachment. Beamwidth: Horizontal plane 360°, vertical plane 60°. Receives inside signal from a cell phone signal booster and directs it to multiple cell phones inside the building. For use inside commercial buildings, offices, and homes. 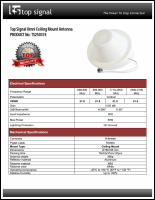 Works with 50‑ohm cell phone signal booster systems. This antenna will not operate by itself; it is one component of a cell signal booster system. Please contact Powerful Signal—we’ll be happy to help you determine what your needs are and what system will work best in your situation.